It took nearly four hundred years for much of the Western world to overcome its fear of tomatoes. The Spanish conquistadores brought the New World fruit to Europe and reported that the Aztecs and Incas ate tomatoes regularly with no ill effect but, early Europeans greeted the American fruit with distrust because botanically it belonged to the deadly nightshade family. Debates have long raged over whether the tomato is a fruit or a vegetable. 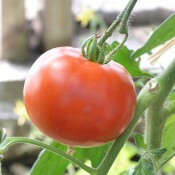 Botanically, tomatoes are fruits, which confused many people because they are most often used as vegetables. In 1893, the U.S. Supreme Court reclassified the tomato as a vegetable. The question became a matter for the courts because of different trade regulations governing fruits and vegetables. Store-bought tomatoes have little of the richness and sharp taste of home-grown variety. There is a dramatic difference in colour, flavour, texture, and juiciness in home-grown vine-ripened ones. 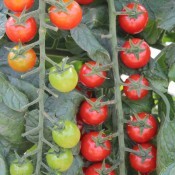 The choice of tomatoes is wide-ranging from pink, red, orange, yellow, green, and even purple in colour. 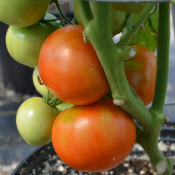 There are tall (indeterminate) and bush (determinate) varieties that produce two-pound giant tomatoes and small cherry ones. The choices are endless. Pear-shaped, roma-type tomatoes are usually very meaty and excellent for canning and sauces; the rounder and cherry types are most often used raw or in baked dishes. 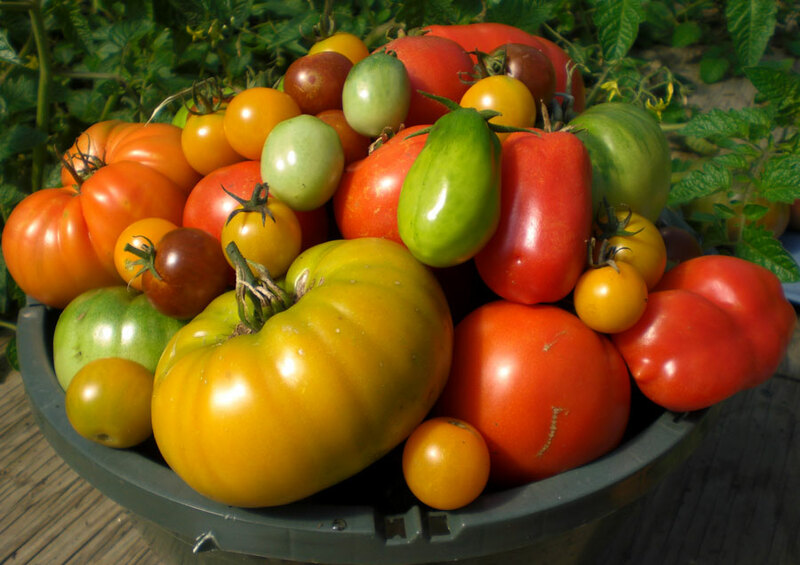 Tomatoes thrive on three things – warmth, plenty of sunlight, and even, steady supply of moisture. 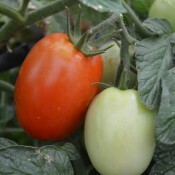 Tomatoes prefer a light, fertile soil with plenty of organic matter. Use a granular or water-soluble fertilizer high in phosphorus and potassium or potash. Avoid excessive use of nitrogen as it reduces yields. Apply mulch around the base of the plants to protect against soil borne diseases and help conserve soil moisture. Water the soil around the plant rather than showering down over the plants. 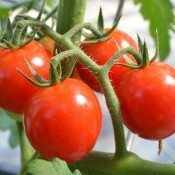 Tomatoes are sensitive to nearby plants so companion planting is important. Beneficial companion plants include beans, carrots, celery, collards, cucumber, garlic, lettuce, mint, nasturtium, onion, parsley, and peppers. Basil and chives are also excellent companion plants because they improve growth, health, and flavour of the tomatoes. Do not plant tomatoes near dill or Brassicas (i.e. cabbage, cauliflower, kohlrabi, etc) because they are known to stunt tomato growth. Furthermore, planting tomatoes with corn, or potatoes is ill-advised because they can contaminate each other. Valuable for vitamins A, C and E, potassium, phosphorus and iron. Tomatoes are rich in lycopene, a powerful antioxidant which may help prevent prostate cancer and some other forms of cancer, heart disease, and other serious diseases. One beefsteak tomato contains about 60 calories; one large tomato contains 50 calories; one medium tomato contains 35 calories; small tomato contains 25 calories and one cherry tomato contains 5 calories. Tomatoes are ready to be harvested when they pull easily from the vines. If you have to tug or pull, the tomato is not ready. When the season is nearing the end, you can pinch off vine tips and any flower clusters to quicken ripening of green fruit. 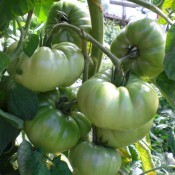 Wrap green tomatoes in newspapers or put in a paper bag and store in a cool, dark place until they ripen. 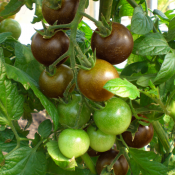 Remember to destroy tomato vines at the end of the season to prevent disease and pests from overwintering. Store, unwashed, at room temperature, stem end down. Do not refrigerate tomatoes, unless they are overripe. Cold temperatures destroy the fresh tomato flavour, texture and aroma. Unwrapped ripe tomatoes can be kept in the refrigerator for a few days. 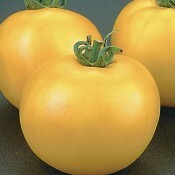 This old fashioned favourite produces good yields of extremely large 1 – 2lbs (454 – 900gram) meaty tomatoes. 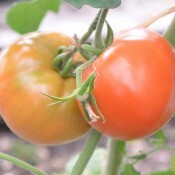 Beefsteak tomatoes produce solid red fruits that are juicy, flavourful and ideal for slicing. This indeterminate vine needs to be staked or supported. 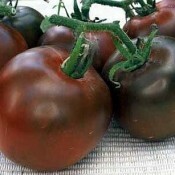 These delectable round tomatoes have a purple-black colour with an irresistible sweet, yet rich flavour. Black Cherry is a tall and vigorous plant with large vines producing abundant crops of exceptional 1″ (2.5cm) fruits. 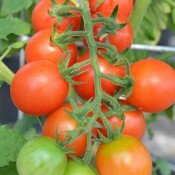 They make a beautiful addition mixed with other cherry tomatoes in the garden as well as in salads. This hybrid bush variety produces exceptionally early prolific yields of tasty 3 -4oz (85 – 113 gr) fruit. 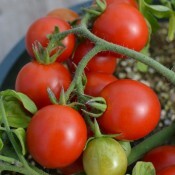 This bright red tomato is plum shaped with thick walls and very few seeds in the flesh. 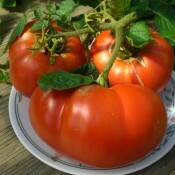 La Roma is a paste-type of tomato that is suitable for canning or for sauces. Vigorous and uniform plant. Lemon Boy is an eye-catching hybrid with brilliant colour and delightful taste. The meaty, 6 oz fruit are an excellent choice for slicing. Bright, lemon-coloured fruit grow on tall vines that will require staking. 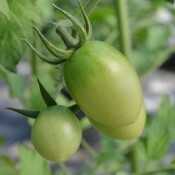 Patio Tomato is perfect for small gardens or container growing. 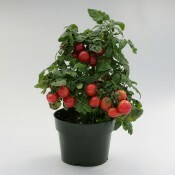 These compact determinate tomato plants bear 4oz (113gr) slicing-type tomatoes. The dark green bushy plant has potato leaf foliage. Determinate. 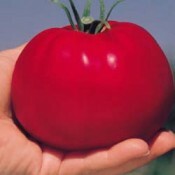 An early red cherry variety that is sweet, juicy with a unique rich tomato taste. The bright red 3/4-1” (2-3cm) fruit is firm and doesn’t crack. A single indeterminate plant produces fruit in clusters all summer. Sugar Gloss is your new go-to cherry tomato variety. 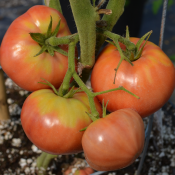 Unlike most vine type tomatoes, Sugar Gloss has two elegant trusses which produce an abundance of bright cherry red fruit. 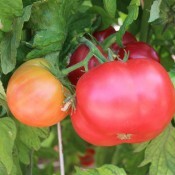 This tomato has a 12% BRIX rating meaning that each 0.75 oz tomato is bursting with sweetness. 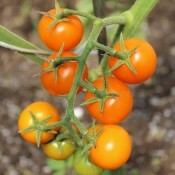 Sungold is one of the most sought after and premier varieties of cherry tomatoes. It ripens to a golden tangerine colour with a rich, sweet, tropical fruity taste. The fruit grows in bountiful clusters on vigorous vines throughout the summer. 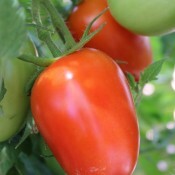 Solid and meaty 10 oz (283gr) tomatoes have smooth skin. This indeterminate plant produces high yields all summer. 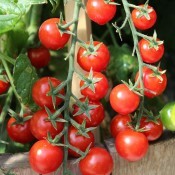 Sweet 100 is a unique hybrid that yields an abundance of 1” (2.5cm) in diameter round, bright red, sweet cherries on vigorous vines. A single indeterminate plant continues to produce hundreds of fruit in large clusters all summer until frost. Sweet Hearts produce incredible yields of full long clusters of small oval grape-type tomatoes that have a meaty texture and sweet flavour. The fruit of this indeterminate plant is brilliant red, very firm and very tolerant to cracking. Good shelf life. Fusarium tolerant. Sweet Million, an improved, disease tolerant version of Sweet 100, is easy to grow. This prolific yielder sets clusters with 20 – 30 deep red fruits. It produces exceptionally sweet 1” (2.5cm) round fruit with good shelf life. Early maturity and good crack tolerance. 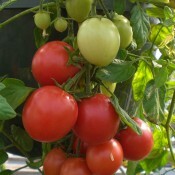 The perfect tomato for hanging baskets and containers. Tumbler is an extremely early hybrid that boasts a graceful, cascading habit. 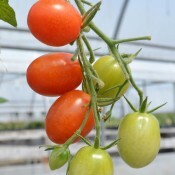 It produces up to 6lbs (2.7kg) of bright red, sweet cherry tomatoes. Fantastic flavour.